There are parallels between what is currently happening in academic publishing to the array of digital disturbances brought upon recording production houses. These similarities are noteworthy for improving understanding of academic scholarship in the digital age. It is interesting to be entering into the field of scholarship in an era of major disruption to the enterprise. It was about fifteen years ago I was venturing into the music industry in a similar kind of fashion. There are parallels between what is currently happening in academic publishing to the array of digital disturbances brought upon recording production houses. These similarities are noteworthy for improving understanding of academic scholarship in the digital age. I was pleasantly surprised when I attended this past week’s “Open Access after Paywall: A Panel Discussion on Scholarly Publishing” in MSU’s main library, where discussants drew on such analogies. In Kathleen Fitzpatrick’s closing remarks, she charged all in attendance to imagine with her what a model of scholarship might look like resembling services like Spotify, Apple Music, or other new forms of mainstream media that have taken shape in the age of digitization. Of course, the internet and Open Access movements have resulted in a diverse array of publication and recording options where nearly anyone can grab a microphone or webcam and start developing audiences on the web. Similarly, the astronomical explosion of online journals and publications have provided many different options for scholars to weigh when publishing their work. Many have decried the eroding potential this could have on the businesses of publication and hence the quality of scholarship. And yet the music industry has changed dramatically in the past ten to twenty years and some argue for the better. 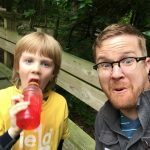 Take an example from the experiences of a musician named David Bazan (Pedro the Lion) who I’ve come to deeply appreciate over the past twenty years. David continues to be a far lesser known recording artist than the likes of Radiohead or Katy Perry who can claim world-wide appeal. Yet, he has continually developed a robust and dedicated fan base. Bazan used to tour and play with the band Death Cab for Cutie who went on to ‘make it big’ in the industry, but he describes a negative influence mainstream music had on their craft despite improved production budgets. In fact, Bazan maintains that artists who don’t ‘sell out’ and continue to stay true to a more intimate audience are far more interesting despite having to just scrape by for living expenses. I had the chance to meet David at a living room house show organized by fans here in Michigan. I remember going to a bar with him after the show that evening and hearing him discuss his concerns with Spotify as an online distribution platform he claimed was not paying artists like him their fair due in royalties. It was only a few short years later that I encountered a distinct change of heart he had to the platform to the point where he embraced Spotify while enjoying his own resulting discovery of new music. I have to wonder if scholars will experience similar resistance and eventual acceptance to emerging forms of academic scholarship in the age of digitization.